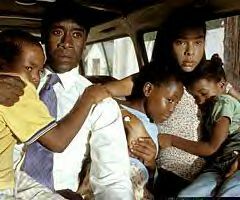 This film is set back in 1994, in the time of the genocide going on in the central African country of Rwanda. 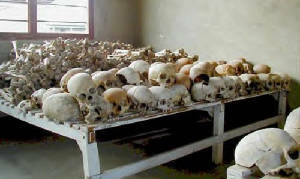 The Hutu's, who are about 90% of the population, were macheting the Tutsi's, and murdered around 80,000 people, men, women, and children alike. The Hutu's had murdered their own leader and blamed it onto the Tutsi's, thus providing the 'interahamwe', local militia's, the excuse for the mass genocide. 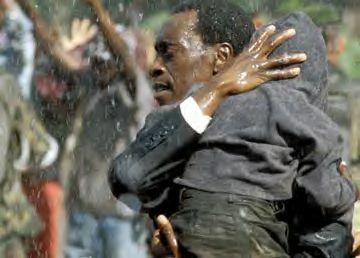 The film depicts the courage and bravery of the true life ordeal of Paul Rusesabagina (Don Cheadle, who is second-in-charge at Rwanda's finest luxury hotel. Paul, a Hutu, is married to Tatiana (Sophie Okonedo), a Tutsi. 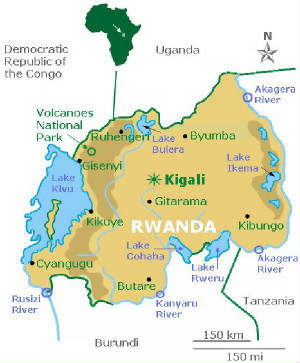 When the genocide starts, Paul uses all his wits, connections, and hotel resources to shelter his family, his neighbors, and eventually over a thousand Tutsi and moderate Hutu refugees inside his hotel.